Hi! About a week ago my friend and I went in on a pair of 1994 yamaha vxr's (his was a vxr pro). When we bought them the guy struggled to turn them over but they eventually did and everything seemed descent accept the oil lines were busted and the hulls were filled with oil. We installed new fuel lines, fuel filters/water separators, spark plugs, and oil pump block off kits and went and ran them the other day. Mine idled like a pro and ran great at 1/2-3/4 throttle, but at full throttle it hesitated. I am trying to figure out what this was from. My guesses were either that the tab on the top of the intake needed to be open, I need to make carb adjustments (or maybe rebuild it), or maybe I am running the wrong mixture (50:1 but a little rich making it closer to 45:1). I don't think adjusting my high speed screw on the carb would change anything because i'm premixing. also, I don't think it's my mixture, because my friend ran the same mixture and he had no issues at top speed. Also, my friend's struggled idling. We set the idle speed decently high but it still staled a lot. His ski is set up with all the same details i told you (new stuff w/ oil block and premix). Any thoughts on what a bad idle could be? Sorry to ask so much, Thanks for your help! I have 2 of vxr pro's. Nice little playful ski. I ride them frequently. Have you checked your compression? Broken oil lines is your key. If it was run at all starving for oil, one or both cylinders got damaged. The more you run it the worse the damage gets. Compression on the 650/701 should be 140/150ish. If that checks out ok then I'd say carb. If you don't already have one the Clymer manual is pretty good on those skis. But most of all get the compression checked before you ride again. Last edited by Dave in DE; 09-22-2018 at 04:13 PM. Hi! Thanks for your response. I just checked compression and my ski has 150psi in one cylinder and 149 in the other (not bad for a 24 year old engine!). My friend's ski had 148 and 144 which i think is nothing to worry about any time soon. The previous owner replaced the spark plug caps on my engine with cheap ones he bought at the lawnmower store. I'm pretty sure that's my problem so i will replace those and pray that it fixes my problem. I also will rebuild the carbs sometime soon because i don't want to risk running with bad carbs and damaging something. For getting new sparkplug caps, can I just buy any 20$ Yamaha OEM plug cap (nonspecific to any engine)? Or should I get the 40$ (each) ones from walmart? Or should I get the entire wire assembly for 100$? I want to be cheap, but I also want to do it the right the first time and only do it once. Both skis compression is great. Wouldn't worry on either. As for plug boots go to Babbittsonline follow through oem parts, yr ext.... $47 apiece. but the true part for what you have. When you go to order carb kits. get true mikuni kits. There a tad more expensive but worth every penny in long run. Also reuse old pop off/needle seat spring and document your high and low screw settings and put them back where they are. You'll be good to go. 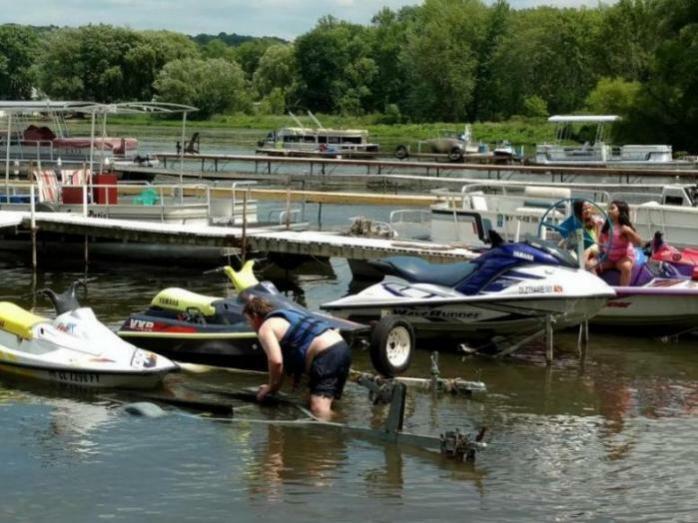 Below is a pic of my 2 vxr pro's 93/94 my cousin launching the 93. Also my GPr and cousins wave venture. Last edited by Dave in DE; 09-25-2018 at 06:40 AM. Fuel/oil mixture at 50/1 is fine. 45/1 gives you a bit of safety. Neither will effect carb settings as they adjust fuel/air mixture. So adjusting carb will affect runnability. For the hesitation try 1/4 turn in/out at a time on high screw. I would try out first. But wait till after carb rebuild. As rebuild may solve issue. We took the good spark plug boots off my friend's ski and tried it on mine and there was no performance difference. So i guess, although new boots were a necessity, it wasn't my problem. I get my parts in tomorrow and will rebuild the carb and replace the boots over the weekend. I let you know if it fixes my problem. Thanks for the help. If you send me a PM with email address, I'll send you a copy of the factory manual I have. Try trimming the wire back about 1/2 ", and rebulid the carb. Could be fuel pump related or just crap in the carb. The last 3/4 of throttle is the high speed screw. avg setting is around 7/8 - 1 turn out as a ball parkish figure. What do the plugs look like ? Plugs were new as of a week ago and I ran it twice. They were a little dark, but fine. Should I remove the spark plug wires and make sure theres no reistance through the entire wire when I replace the boots? or should I just cut it and not worry about it? I'm rebuilding the carbs tomorrow. I'll reset all the carb settings to stock and I'll let you know if that fixes it. Thanks for your responses. Manual sent. Let me know if it opens ok.